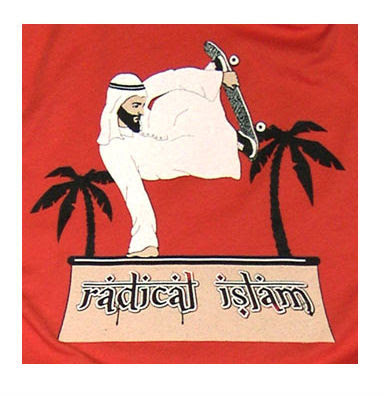 Detail from the Radical Islam t-shirt via FiddlyIO. • I've heard of seat-fillers, but for architectural firms? After massive layoffs, a firm boss "was offering $100 cash to employees' friends who could come in during the meeting, sit at desks, and look busy" -- all for the benefit of an important client. • Photojournalism bits: NEED magazine has a nice gallery of Nepalese girls spared from human trafficking, and the World Press Photo of the Year goes to a news shot of a sheriff clearing a home after an eviction. • With all due respect to Twin Cities illustrator Mary GrandPre, M.S. Corley's speculative Penguin Classic-style book covers for the Harry Potter series are a refreshing change of pace. Via Curate. • Vito Acconci on VBS.tv, via Culturebot: "The great thing about words is they seem so definite but they're so hazy and cloudy." • This starts out as a bit of classic culture-jamming, but then gets weird: Shoppers in Grand Forks return to their cars to find fake parking tickets on their windshields, with a note to go online to see evidence of their infraction. When they get there, malware is downloaded to their computer. • Improv Everywhere wants to give you a high-five. • Pie chart of pie-shaped light.